SALT LAKE CITY (AP) — Utah coach Kyle Whittingham signed a contract extension Monday that could keep him with the Utes through the 2023 season. COLUMBUS, Ohio (AP) — New Ohio State coach Ryan Day has hired a second assistant away from rival Michigan. 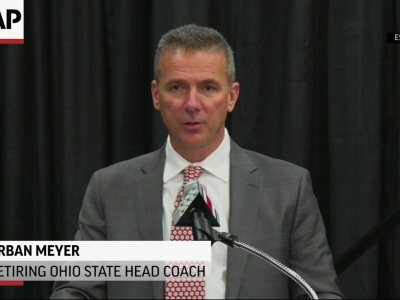 COLUMBUS, Ohio (AP) — The investigation that led to a three-game suspension of Ohio State football coach Urban Meyer cost the university $1 million, twice the amount originally requested for it, the school said Thursday. COLUMBUS, Ohio (AP) — Oklahoma State offensive coordinator Mike Yurcich has been hired as quarterbacks coach and passing game coordinator by Ohio State coach Ryan Day. PASADENA, Calif. (AP) — Urban Meyer sees the Rose Bowl nestled in verdant Arroyo Seco on a sunny winter day and thinks back to the formative days of his coaching career. LOS ANGELES (AP) — Ryan Day is definitely not the first assistant coach to spend his collegiate career filling up a notebook with plans, diagrams and all sorts of other information that will come in handy if he ever gets his chance to be a head coach. Unlike most of those aspiring sideline stars, Ohio State's head-coach-in-waiting knows exactly when he'll get to employ all of that collected wisdom. COLUMBUS, Ohio (AP) — Ohio State coach Urban Meyer will teach a class in the university's business school and become an assistant athletic director after he retires following the Rose Bowl. Meyer will co-teach "Leadership and Character" during the spring semester and be available to up to 198 students. Meyer's teaching partner will be Army Lt. Col. Charles Buchanan, a senior lecturer at the business school who spent 15 years serving tours in Afghanistan, Iraq and Kosovo. Meyer ignored speculation about his coaching future and deflected talk about what No. 6 Ohio State would need to earn a spot in the college football playoff. Instead, Meyer stuck to the same message he's relayed to his team all week: Just focus on football. As nerve-wracking as it must have been for Ohio State fans to watch the wild, back-and-forth overtime victory against Maryland , it has become just as uncomfortable to watch coach Urban Meyer endure his team's games. COLLEGE PARK, Md. (AP) — Ohio State coach Urban Meyer hates having to defend the performance of his ninth-ranked Buckeyes, who still have a shot at winning the Big Ten and the national championship heading into Saturday's game at Maryland. EAST LANSING, Mich. (AP) — The ball was loose in the end zone only briefly before Dre'Mont Jones recovered it, giving Ohio State a touchdown that turned the game in the Buckeyes' favor for good. AP Top 25 Podcast: Hot-seat season’s here; Who’s in trouble? The back half of the college football season means playoff races and coaching changes. On the latest AP Top 25 College Football Podcast , Dan Wolken of USA Today joins AP's Ralph Russo to discuss which coaches could be in trouble and why the potential is there for a slow silly season. Finances might determine who gets fired over the next month in an half as much as record. COLUMBUS, Ohio (AP) — Ohio State receiver Austin Mack is out indefinitely following foot surgery. Buckeyes coach Urban Meyer confirmed Tuesday that Mack would be sidelined after injuring his foot Saturday in a loss to Purdue. Meyer called it "a big loss" and said Mack could be back in time for a bowl game.